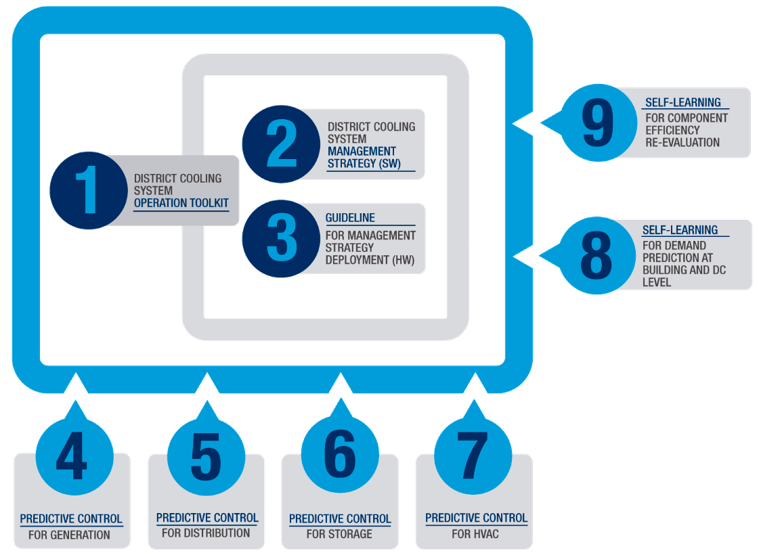 The main objective of INDIGO is the development of a more efficient, intelligent, and cheaper generation of District Cooling (DC) systems by improving system planning, control and management involving all components and levels of a DC system. DC system components: generation (blue), distribution (arrows), storage (red) and consumption (green). INDIGO involves the development of a highly efficient and intelligent DC system based on the development of an innovative and optimized DC system Management Strategy, and the integration of predictive controllers at component level, some of them including self-learning algorithms for accuracy improvement. Besides, open source tools and guidelines will be developed within the project in order to provide more confidence and thus more openness to DC systems development and use. 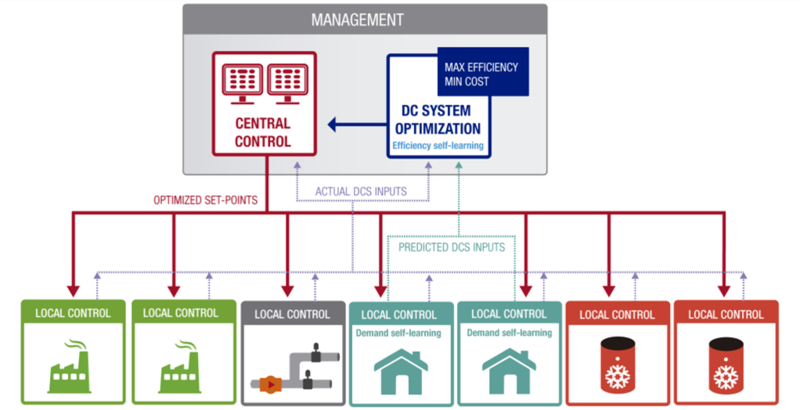 The management strategy is the first control level of the DC system. Its main target is to schedule the energy supply in order to cover the energy demand at each moment. INDIGO will develop an innovative and optimized management strategy (algorithms) focused mainly on energy efficiency maximization but also on energy cost minimization, taking into account at the same time other factors like greenhouse gas emissions, system payback time, etc. One of the main characteristics of this innovative and optimized strategy is the predictive management: INDIGO DC system manager will consider predicted values for the consumers’ demand, the meteorological conditions and the price of energy (in connection with intelligent gas and electricity networks). In order to develop this strategy two management levels will be established. Public administration: depending on the country/region, more or less involved in district energy development projects, but most of the times acting as project assessors. Private ESCO: as responsible of DC system design, deployment, and O&M.